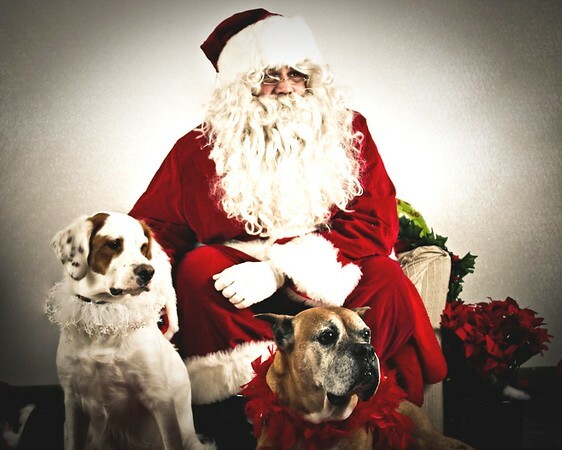 Cosgrave Studios: Pet Pics with Santa now uploading! 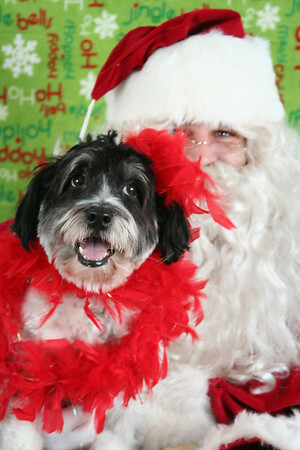 Pet Pics with Santa now uploading! It's been a crazy couple of days! Bad weather, injuries, a computer that kept crashing, and a printer that only wanted to print in green... but we kept on truckin' and everyone had a great time hanging out and getting quite a big sugar rush from all the candy! The dog's seemed to have that holiday spirit too, as everyone gathered in the aisle during our impromptu meet and greet, patiently waiting for the computer to show off their pics. We had a chance to see some familiar faces too. Mike and Marley, knew just what to do as they posed for shot after shot. It was quite a job getting them both to look in the same direction at the same time! They looked so cute that I decided to create a vintage looking photo. We were lucky enough to get Miss Zsa Zsa fresh from the groomer. She was such a good girl, even though you could tell she'd had quite enough of all the fuss for the day. 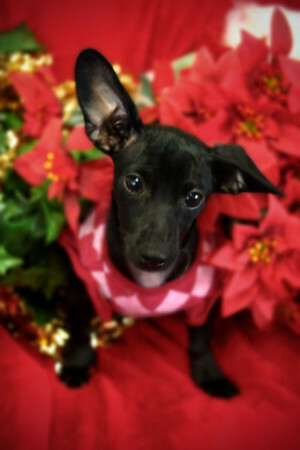 London the Doxie Mix was nearly beside herself when she thought her daddy had left her. But he was only trying to hide behind me so she wouldn't be distracted. No such luck! What a pout! Divas come in all shapes and sizes!! Pepper, the adorable cockapoo loved being glammed up for his pics, even letting us clip feathers in his hair! We saw so many sweet and adorable dogs yesterday, but there was one who really stole the show. 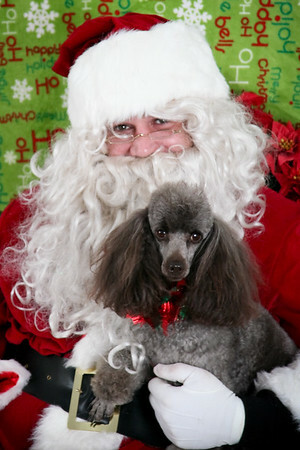 Arlo, a 5 year old Shepadoodle (that's a German Shepherd/Standard Poodle cross) was so scared of Santa that he was shaking! So, we decided to dress up Arlo instead. It was actually pretty difficult to finish taking the pics we were all laughing so hard. He was thrilled with all the attention of course! 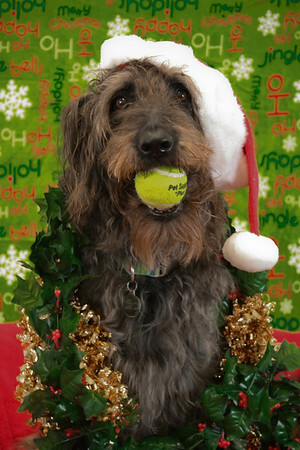 We thought this was the perfect shot for a greeting card, as well as an excellent promo for Pet Supplies "Plus"!